Airing My Laundry, One Post At A Time...: Did You Get A Lot Of Chocolate? Did You Get A Lot Of Chocolate? 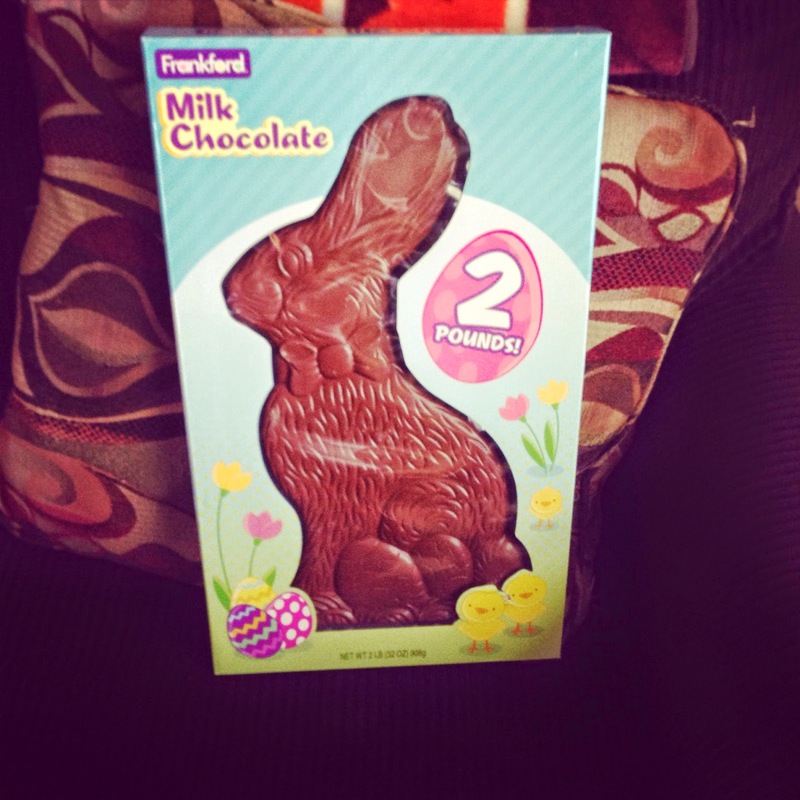 Tom surprised me with it--er, I mean, the EASTER BUNNY did. For like five minutes I thought I might have gone overboard. And I saw people were getting American Girl dolls. iPods. iPads. Can that Easter Bunny come here too? Were those people trying to compete with Mariah Carey's "dem babies?" or what? We had chocolate for breakfast. We might have had chocolate for dinner if my friend Jennifer hadn't invited us over. We enjoyed a real meal there. Ham. Potatoes. Green bean casserole. Deviled eggs. She said, "Natalie bunny wants to be left alone." I hope everyone had a chocolate-filled Easter! yep, plenty of chocolate this year as well! my kids love looking for eggs and will have some the day of but then i am stuck eating all the chocolate eggs or bringing them to work cuz they dont touch them afterwards!! What's really funny is that I have a friend who posted on Facebook about how ridiculous it is that people spend a lot of money on Easter. She said, "It's not Christmas, people!" And guess what happened? Her husband got her daughter a ride-in Jeep and her son got video games. She got a diamond heart necklace. She changed her tune after that! It was hilarious to watch it unfold. My kids got a basket and some chocolate, just about like you. I see no need to go overboard.... unless of course it is a 2 pound bunny of chocolate; because that's just Right. I got one of those Lindt Gold Easter Bunnies -- meaning gold FOIL - not a solid gold Faberge style chocolate. And that's about as fancy as we get. But I do cook the required ham dinner. It helps with the chocolate coma recovery. I didn't get any chocolate - but I'm might still the boy's Reeses bunnies!!! 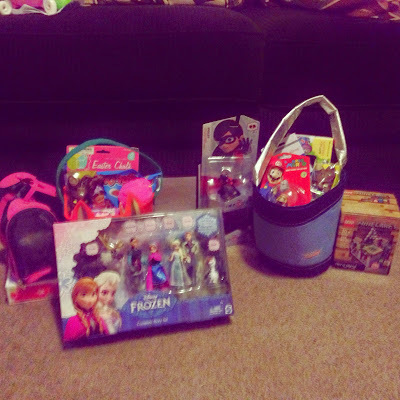 Some of the baskets I saw on Facebook made me think Easter was little Christmas. Good Lord. Literally. The Easter bunny always brought lots of chocolate to our house. In fact, my oldest daughter considered it a food group for awhile. It actually has nutritional benefits, and sticks to the teeth less than the candy, so I am all for it!! And your daughter is beautiful! Three cheers for a chocolate filled weekend. And... since when is Easter such a present holiday?! I mean growing up I got like a toy, chocolate and some needed things. These days it's like a competition to see who can gift the most. Crazy! So cute!! You totally did not even come close to going overboard! My kids got flip flops and toothbrushes. Oh, and sunglasses. I actually didn't even buy them that much candy. Not because I was trying to be healthy, but I honestly forgot! Whoa! American dolls and ipads! That crazy! My boys are older now but they would get some of their favorite candy and bubbles, kites and new basketball if they were lucky! I think Easter gifts are a newer phenomenon--at least when I was a kid we never got anything for Easter though we did go to community Easter egg hunts sometimes, that was about it! I'm with you... people went WAY overboard on the gifts. It's not Christmas, people... relax! Someone needs to tell the Easter Bunny that he forgot to stop by my house and drop off that iPad basket. My poor tortured future kids are only getting candy, books, and maybe clothes. Holy cow. iPads for Easter? That's crazy. I guess it's kind of along the same lines when you hear the tooth fairy left a $20 for the first tooth. Not here...my kids got some candy but not so much that I felt bad that they ate it the first day. I love Natalie's bunny ears and the 2LB chocolate bunny you got! Could you really et such a cute looking bunny? The Easter bunny bought too much chocolate to us too, I had to put the rest of mine in a box under the bed as I was starting to take on the shape of an egg! I will dig some out again on Friday as that's our junk food day. Right? Some kids got a new wardrobe a bike...my kids got a bucket with some eggs and candy in it...guess im not mom of the year! Cute ears! Only the candy he got from the egg hunt. I'm not a crazy parent that gives gifts on Easter. Only birthdays and Christmas. Yes! I got an Easter basket from husband-bunny, too. I love seeing people go overboard. I don't go overboard with gifts but I make it look like I did. Your baskets look great!